Because researchers investigating the smelling abilities of dogs collect data in a variety of ways, it is difficult to compare one breed to another. While researchers have collected some concrete data, such as the relative number of smell receptor cells a breed possesses, most of the available evidence is anecdotal. Testing protocols vary widely and the presence of human handlers introduces additional variables, complicating objective analysis. Nevertheless, some breeds consistently perform well, and are often employed by humans, who seek to harness these abilities. A policeman and his sniffer dog check luggage. A pack of bloodhounds next to horses on a hunt. Most authorities consider bloodhounds to have the strongest sense of smell among dogs. The anatomical data backs up this assertion, as bloodhounds have between 240 million and 300 million smell receptor cells in their noses. Often employed by police to track fugitives, the bloodhound's loose facial skin helps to collect scent-bearing particles. Basset hound running with bone. Standing less than 14 inches from the ground at the shoulder, basset hounds live close to the ground, where the odor trails left by their prey are strongest. Historically, this prey could have been any type of small game that was slow enough the hunters could keep up. The long ears of basset hounds flip scent particles towards the nostrils, which helps to maximize the breed's tracking ability. Beagle licking his lips and walking. Beagles originally were developed as a rabbit-hunting breed in the 1500s. During the course of developing beagles, breeders not only selected dogs with a strong sense of smell, they selected dogs with a strong desire to follow and track odors. Although beagles are a relatively pint-sized breed, weighing about 30 pounds, they have about as many scent receptor cells -- around 225 million -- as 75-pound German shepherds, who have an excellent sense of smell. German shepherd lying on grass. The long snouts of German shepherds create more surface area in their nostrils, which helps increase their ability to detect faint odors. Police and military personnel have used German shepherds to detect contraband and track people for decades. In contrast to beagles and basset hounds, who sniff the ground when tracking, German shepherds keep their heads higher, and sniff the air. A Labrador retriever standing in deep snow. Many Labrador retrievers and mixes make their living as contraband-sniffing dogs. While their friendly demeanor helps make them popular with pet owners and handlers, it is their enthusiastic prey drive that helps maximize their ability to detect hidden items via their nose. Labs are able to detect a number of different substances, including bomb-making materials and narcotics, while others are trained by beekeepers to search for hives containing bee-killing bacteria. A dachshund puppy standing on a rock. Developed to track and hunt badgers, dachshunds have a very strong sense of smell. Modern hunters often use dachshunds to track wounded game animals. 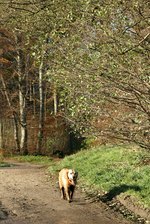 Part of the reason dachshunds excel in this application is their ability to follow the correct scent trail, even in the presence of other, similar scent trails. A black and tan coonhound's ears being held out during a dog show. Breeders created black and tan coonhounds to track, trail and tree raccoons. Derived from foxhounds, black and tan coonhounds frequently tree squirrels and other small game -- even prior to receiving training. Black and tan coonhounds are celebrated for their "cold nose," which refers to their ability to detect and follow very old trails. Relatively large hounds, weighing up to 80 pounds, bluetick coonhounds are somewhat similar to black and tan coonhounds, in that they have a strong instinct to tree small game. Additionally, bluetick coonhounds have a "cold nose," lust like their black and tan cousins do, which allows them to follow old tracks. Bluetick coonhounds tend to follow their nose, and often become distracted when they encounter interesting odors. White poodle standing on grass. Poodles are intelligent dogs, who have long been beloved pets and performers. However, poodles also are equipped with a strong sense of smell. While breeders developed the original poodles as water retrieving dogs, the miniature variety was developed and used to locate truffles – subterranean, edible fungi. Mature woman petting a golden retriever on the beach. Some of the most popular dogs in the world, golden retrievers are hunting dogs with an excellent sense of smell. Partly due to their nose and partly due to their fantastic personalities, golden retrievers are used as cancer-detecting dogs. Doctors are working to create a machine that performs the same task, but thus far, none compare with the nose of a well-trained dog.